Delhi is the national capital of India and is the hub of most prestigious engineering colleges. Delhi has around 30 engineering colleges/institutions including NIT, IIT and IIIT. Among them some are private colleges and some are government colleges. Delhi engineering colleges are most popular in terms of infrastructure, campus placement, highly experienced faculty and campus placement. The most common streams of engineering in Delhi engineering colleges are Computer Science Engineering, Information Technology, Electronics and Communication, and Mechanical Engineering. Indian Institute of Technology, Delhi: This College is established to contribute India through excellence in technical and scientific education, and research and to serve as a valuable resource for society and industry. Delhi Technological University, Delhi: It is one the oldest and first engineering college of Delhi established in 1940. SRM University, Delhi: It is one of the best engineering colleges affiliated by University Grants Commission (UGC) offering engineering courses for undergraduates, postgraduates and doctorates. Amity School of Engineering & Technology (ASET): It is an engineering affiliated to the Guru Gobind Singh Indraprastha University. It was the first college to qualify in a B-Tech Program. Guru Tegh Bahadur Institute of Technology, New Delhi: This institute has collaborated with IBM Due to this collaboration IBM trains students/faculty. Its placement cell collaborates with multiple companies like HCL, NIIT Technologies, IBM, Accenture which helps in recruiting the final year students. Bharati Vidyapeeth’s College of Engineering, Delhi: This College located in Paschim Vihar is spread over 5 acres of land having eco-friendly environment and has excellent infrastructure with all major facilities. It has an active placement cell which engage with multinational companies for the placement of their students. Maharaja Agrasen Institute of Technology: It is one of the best and top private colleges of Delhi spread in an area of 10.5 acres of land and is well linked to fast transport, a facility available throughout the day. It has been on 9th rank among best engineering colleges of Delhi. Some of the other colleges are Guru Gobind Singh Indraprastha University, Indraprastha Institute of Information Technology, Indira Gandhi Delhi Technical University for Women, Jamia Millia Islamia, National Institute of Technology, JIMS Engineering Management Technical Campus. These colleges are either approved by University Grants Commission (UGC) or All India Council for Technical Education (AICTE). Mechanical Engineering is the oldest discipline of engineering which applies physics, engineering and material science principles for analyzing, designing, manufacturing and maintaining of the mechanical systems. In other words, it is that branch of engineering which involve the production, designing and operation of machinery. It needs the core understanding of dynamics, mechanics, kinematics, thermodynamics, structural analysis, material science and electricity. Beside this, focus is on using of some tools such as CAD (Computer-aided Design) and product life cycle management to analyze and design industrial equipment and machinery, watercraft, aircraft, medical devices, robotics, transport systems, heating and cooling systems. These colleges have their own campus placement cell which is engaged with most reputed organization. Some of the reputed government organization which has recruited engineers from these colleges are NTPC, ISRO, CESC and private firms are Infosys, IBM, TCS (Tata Consultancy Services), etc. The demand of Mechanical Engineers is increasing in all manufacturing facilities such as automobile engineering, steel and power sector, drilling and mining industry, biotechnology, petroleum industry, cement industry. Before 1000 years ago engineering is not so important as compare to today world. because at that time resource and consumption ration are equal means people easy to maintain his lifestyle according to nature. no motor , no industries and transport system. Today world is not work even i=one second without engineering equipment, because our life style and habits are as per our environment , and our environment are not have a engineering model where each and every thing used any engineering technology in any of phase. my concern is which one engineering branch come first, that is an confusion but we can say Mechanical and civil engineering are come first, because machine and houses are prime requirement of human , after that electrical engineering come now we have more that 32 branches in engineering in our world. In my opinion Mechanical Engineering is very important branch of engineering , it consider all type machines that are used in any industry, motor car etc. India have thousands of engineering college who are providing mechanical engineering education, but my question is which engineering college is best for mechanical engineering ? It is very typical question because nothing is best and nothing is worst it vary from person to person capability , because a normal or average student can take admission in IIT, so can his dream fulfill ? It means a average engineering college is best for this type students, no doubt in this an IITins and normal college engineering have differences, Industry required all type engineers because some time best engineers are not solve the issue but a normal and base engineer solve the issue because he look problem in his attitude. The SRM university is Best engineering College in Deemed and Private category in Sonipat, Haryana, Have a big campus with lot of greenery and good facility in campus, you can do study for mechanical engineering. Engineering is a 4 year program in different courses as BTech in Electronics & Communication Engineering. Electronics & Communication Engineering degree is the collection of major three technical areas: Mathematics, Physics, and Computer. The curriculum of course are on fundamental principles of electronic devices and circuits, computer architecture, microprocessors, VLSI and embedded systems, electromagnetic field theory, digital signal processing, microwave and broadband communications and digital communication reading. There engineers are design electronic equipment which are used for entertainment, computers, communication and defense and many more areas. Engineering in Electronics & Communication, is the best course for students who are interested in the field of electronic devices, computer systems, create circuits and they want grow-up own career in this field. SRM university is the best platform and education institute for all students who are interested for admission in the course i.e BTech in Electronics & Communication Engineering. SRM University always providing more opportunities and students can grow-up career and SRM providing placements in industries with high packages. SRM university providing engineering degree at the affordable cost and providing scholarship. All 12th pass students can take admission in this course , with strong mathematics, solving complex aptitude ,and who are interested in Electronics devices, computer systems etc. The Mechanical Engineering(ME) prepares the students for wide range of career choices in the field of mechanical engineering. The Mechanical Engineering deals with design, machines and all the other equipment to be used in mechanical industries. The ME offers specializations in various field like thermal engineering, design, and production engineering, Industrial Engineering, Automobile Engineering, Aeronautical etc. It provides jobs opportunities in most reputed manufacturing firms, government departments, public or private sector industries. B.Tech in Mechanical Engineering is a 4 year degree.In the program workshops, assignments, lab sessions, seminars, training, projects and independent study students are trained to face the challenges in mechanical engineering industry. Eligibility: Candidates must have secured at least 50% aggregate in PCM 12th Standard or equivalent examination, recognized by State or Central Education Board. Candidates must have chosen five subjects and studied Physics, Chemistry, and Mathematics as core subjects in 12th Standard. M.Tech in Mechanical Engineering/Production Engineering is a post graduation course which deals with the study of mechanics, Kinematics, Statics, Material Science, Thermodynamics used in construction, development and installation of tools and machines. Mechanical/Production Engineers are concerned with planning, designing, maintaining and controlling all the activities for the production of the products in the organization. The main purpose of the Mechanical/Production Engineers is to increase the productivity of the products by and maintain its optimum quality by adopting integrated design and efficient planning. Candidates must have completed Bachelor’s B.E./B.Tech. in Mechanical Engineering / Production Engineering / Industrial Engineering / Automobile Engineering / Aeronautical Engineering with 50% marks in aggregate. Duration: Minimum duration for Ph.D. is 3 years including course work and maximum of 6 years (full time / part time). Eligibility: Candidates must have completed Post graduation in the relevant discipline from a UGC recognized University with 50% marks in aggregate. However the candidate with M.Phil/NET/SLET /CSIR-UGC/JRF cleared in the relevant subject is exempted from Entrance test. The Academic Orientation Programme was celebrated at SRM University Delhi-NCR (Sonepat), where hundreds of newly-enrolled students and their parents participated with attention and enthusiasm. After lamp-lighting and invocation to goddess Saraswati, Dr. Sanjay Vishwanathan, P.S. to Chancellor, SRM University, displayed a video-clip on the academic journey of SRM Group of Institutions from its beginning to the present times. Dr I K Sharma, Dean-Academics, welcomed the gathering, encouraged the students for choosing SRM University Delhi-NCR, and emphatically articulated the need, progress and innovation discourse of the modern science and technology and its importance in a developing society. Chief-Guest Shri Ashwin Shenvi, IPS, Superintendant of Police, Sonepat, Haryana, in his key-note address, not only greeted the new-comers of the university but also inculcated the value of self-confidence and positive attitude. Acknowledging the fact that he was immensely inspired by Dr A P J Abdul Kalam, he advised the students to reach whatever positions they want to be. Shri P. Dasgupta, Career Education, IBM India/South Asia, emphasized on convergence of knowledge, adaptability to new technology and developing skills for achieving a successful career. Dr. P. Prakash, Vice-Chancellor, SRM University Delhi-NCR, exhorted that today is a memorable day as SRM University is meant for higher education and cutting-edge research, and aimed at making a world-class university with all its latest infrastructure and research facilities. Moreover, he cheerfully counseled to the newly-joined students the importance of knowledge production and acquisition through expansion, equity and excellence along with ethos and ethics. Shri Ravi Pachamoothoo, Hon’ble Chancellor, SRM University Delhi-NCR, encouraged the students, expressed the vision of University, and inspired that the SRM Universities at Chennai, Sonepat, Gangtok and Amravati, including all other colleges and institutions, are imparting and inculcating around 100,000 students, who represent different countries and their diverse culture. Most importantly, he pointed out, 6000 students of SRM Group are employed by reputed institutions across the globe this year. 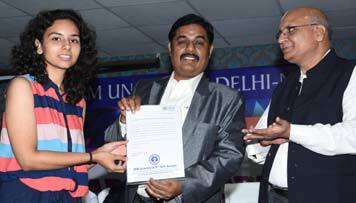 He also felicitated thirty eight meritorious students with Chancellor’s Scholarship. The function ended with a vote of thanks by Prof Manish Bhalla, Registrar, followed by the National Anthem.